The LF101A is a complete data logging system that accurately measures and records leaf wetness. Not only does it record the presence of water but also logs the amount of water on the sensor. The sensor responds to environments the same way a real leaf does and can also detect when ice is present. This low cost system comes complete with a data logger, weatherproof enclosure and leaf wetness sensor. 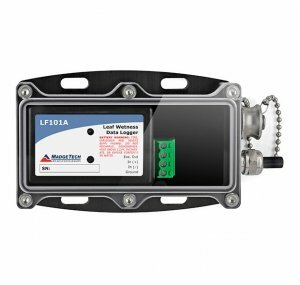 The LF101A is ideal for plant disease forecasting, irrigation studies and monitoring frost cycles. It features a multiple start/stop function, ultra-high speed download capability, 1 million reading storage capacity, optional memory wrap, battery life indicator, optional password protection, programmable alarms and more. An IFC200 interface cable and software is required for use with the LF101A. The device can be started and stopped directly from a computer using the MadgeTech Software.